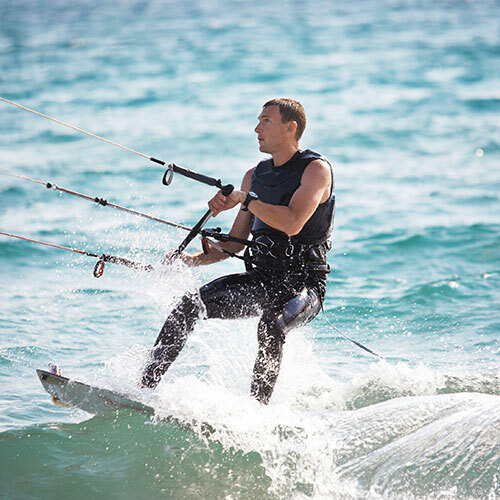 The exotic destination of Kalpitiya, is perfect for kitesurfing in Sri Lanka, with super spots for surfers of all levels, from beginners to professional free stylers. The kitesurfing season in Kalpitiya is from May to October, when winds range in between 20 – 25 knots; this is the perfect time for kitesurfing enthusiasts to visit Sri Lanka. We operate an excellent kite school, which is the ideal place to learn and improve your kitesurfing skills, and is the most competent kitesurfing coaching camp in Sri Lanka. Backed by experienced IKO certified (International Kiteboarding Organization) instructors and the best gear with proven safety protocols, students can obtain IKO Kiteboarder Cards upon successful completion of lessons. A top Sri Lankan beach attraction, Kalpitiya has the best conditions for kitesurfing in Sri Lanka in tropical waters, with access to a flat water lagoon and the Indian Ocean, which gives surfers ample playground to enjoy both free rides and wave riding. The flat water lagoon is excellent for beginners, whilst the rolling Indian Ocean waves are exciting for seasoned riders. Kalpitiya offers other activities such as dolphin and whale watching, snorkeling and fishing during the months – December and March. After a thrilling day of kiting, gather around a fire on the beach to mingle and enjoy some entertainment with your fellow guests. Musical instruments are available, guitars and drums for those of you who are in the mood to make some music. The drinks are chilled and the seafood is fresh from our doorstep, what better way to unwind and relax. Some nights we have our visiting DJs spinning for you, with some dancing.